This is Part One of the three articles I first wrote each night after returning home during the process of learning to dive. It took just under three days to get my PADI Open Water diving certificate, which is the first diving licence you can get. (Yes, I got my diving licence before I got my driving licence - #priorities!). 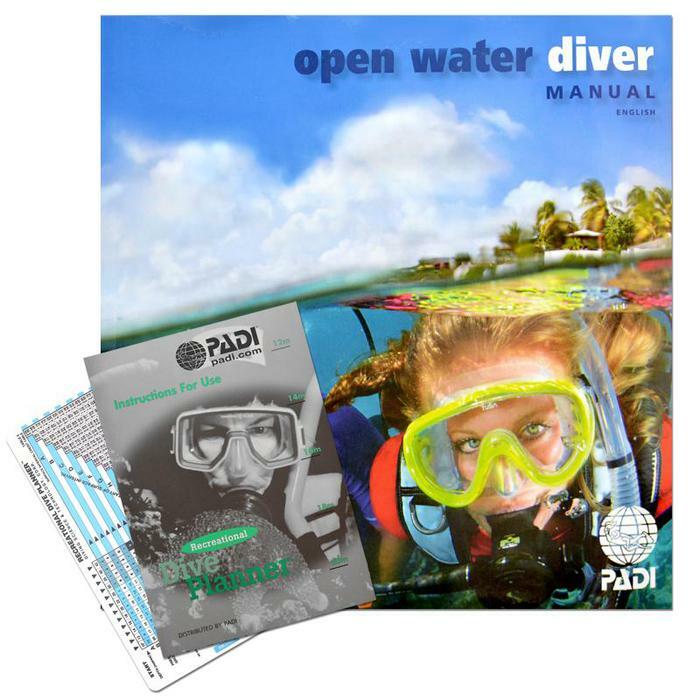 The PADI Open Water certificate teaches you diving skills and theory; you also learn about the equipment and the science that keeps you alive while you dive. The bonus is the OW allows you to dive to depths of 18m, which you can't do on a 'fun dive' day excursion (as it limits you to only 12m deep). Here, I'll explain to you what the process of learning to dive is really like! 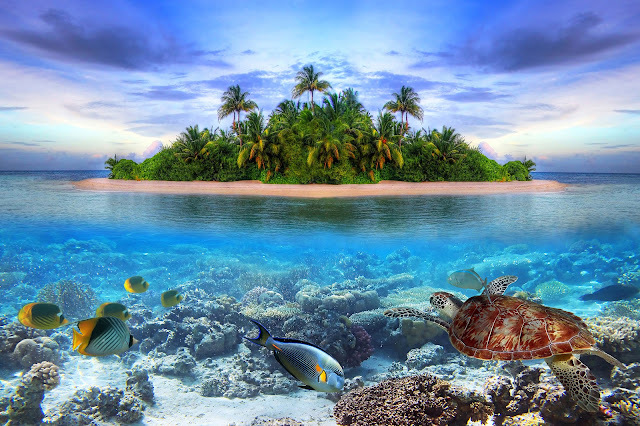 Have you ever thought about diving in the Maldives? Professionals rate it as one of the best places in the world to dive due to the beautiful clear water and mind-boggling array of aquatic life. 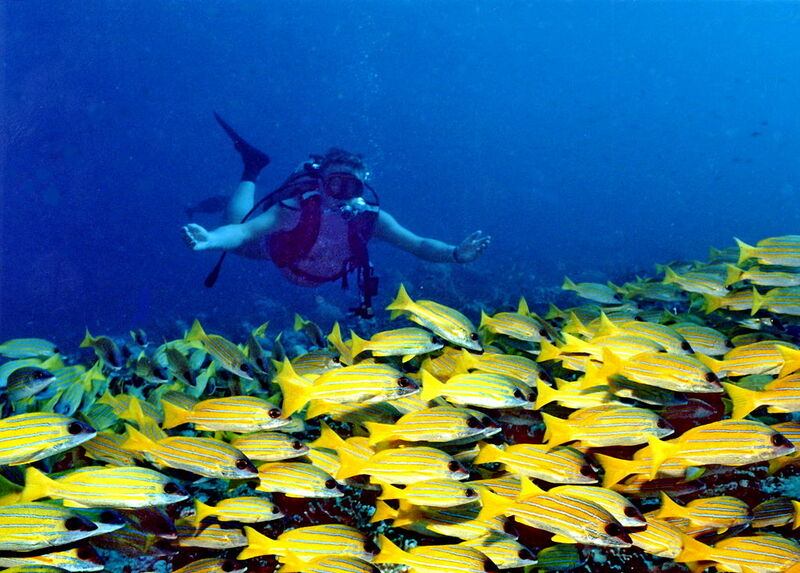 But if you’ve never learned to dive before, what sort of experience can you expect? Well, I’m not a certified diver either but today I took my first steps towards becoming a PADI Open Water Diver. Over the next few days I’ll be updating you with all the info on the process and basically giving you the lowdown on the day-to-day experience of taking a PADI Open Water Course in the Maldives. I’ve signed up for a PADI Open Water course with a well-reputed PADI dive school based in Hulhumale, Maldives (now relocated to Maafushi), which is around 5 minutes by speedboat from Male’. I popped in to sign a medical questionnaire which basically checks I’m not hiding any serious conditions or at least that I have nothing for the instructors to worry about. You don’t have to be super fit but being in general good health is helpful and being a non-smoker is definitely an advantage. With that out of the way, I’m ready to start learning to dive! Diving doesn’t happen in the classroom, but it certainly started there for me today. I arrived at Into Scuba at 8.30am (I’ll admit a little bit bleary-eyed) and was welcomed by my German Instructor friend, Thomas Badstubner with a big cup of tea in a Munchees biscuits mug with ‘Bite me’ written on it. I’m not thinking about sharks. Why did I just think about sharks? But no, joking apart, sharks aren’t really anything to worry about in the Maldives. 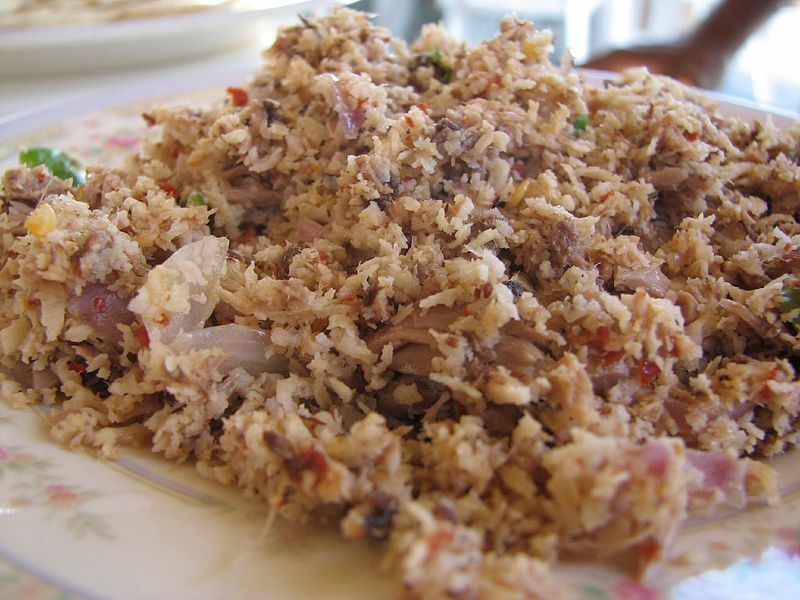 There hasn’t been a single shark attack recorded since the late 1970s, people say it’s due to the huge quantities of yummy fish around here which taste a lot nicer than people. Also you mostly see reef sharks here which aren’t a problem. I’ve been snorkelling here every week for two and a half years so I’m pretty happy with that explanation. Moving on from tea and toothy things, Thomas then told me that I was going to get all of the theory out of the way in one day so that I could get out of the classroom and start diving as soon as possible. Sounded good to me, assuming that I passed! Thomas went on to say that 10 year olds pass the same tests, so he was pretty confident that I would be able to. (Maybe after a cup of tea). So, I was issued with three shiny new books, “PADI Open Water Diver Manual”, “How to Use and Choose Dive Computers” and my “Dive Logbook”, and was told that I’d be watching a series of chapters from a PADI video then we’d have a test between each chapter. There were five chapters and after each chapter Thomas would chat with me about theory, sometimes using a whiteboard to explain, then I did the tests. The PADI videos were….well, I have to admit, a bit cheesy (lots of high fives) but they were clear and easy to understand, so they definitely got the point across. They gave me the grounding that I wanted and needed, basically the science behind diving and what all the bits of equipment are called! With a few chapters out of the way, it was already time for lunch. Thomas and I strolled around the corner for a fish curry with roshi (local bread) in a café. It was good to get out of the classroom to reflect on the morning. I had enjoyed learning about what happens to your body when you dive, and all of the bits of equipment now had proper names in my head. This made me feel much more confident about what I’m going to be doing tomorrow. Thomas said that I seemed to be doing OK so we were going to zoom through the rest of the chapters today. So it was back to class! Over the next few hours we continued in the same pattern of watching videos, Thomas explaining a few things and me taking tests. They were mostly multiple choice and “fill in the missing word” type questions. 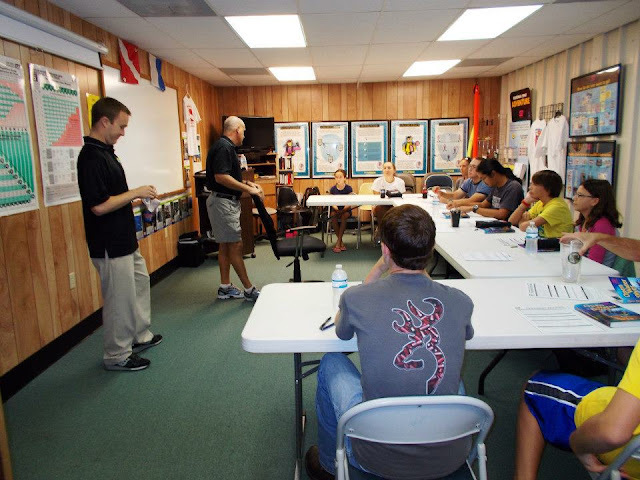 We got into the nitty-gritty of Dive Planning and problem management, including how to deal with your own problems as well as your dive buddy’s and basic first aid. This included (in detail) possible hazards relating to breathing air at depth, how to prevent problems from arising and what to do if you do have problems. Finally, we covered dive tables, dive computers and the “How to Use and Choose Dive Computers” book. “Whaaaaat?” You may be asking yourself. Dive computers are basically a fancy watch/calculator which tell you things like how deep you are, how long you’ve been underwater for and your no decompression limit (the maximum allowable no-stop time at a given depth). 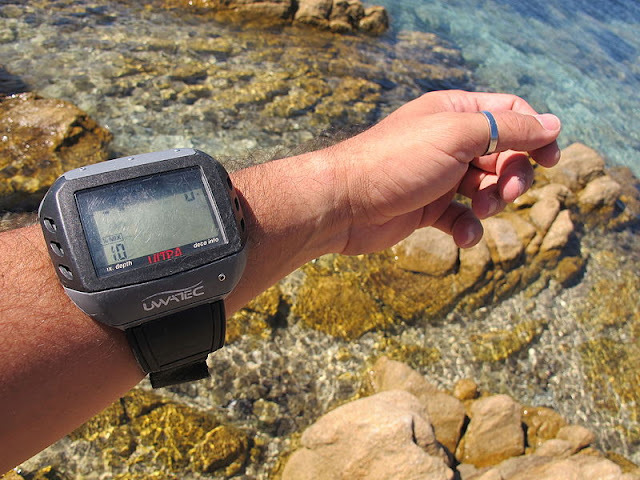 They certainly seem to help to make life easier, and are also useful because they can calculate how long you can stay underwater for before reaching your no decompression limit if you’re doing one of several dives (repetitive dives), because it changes. With all of the theory out of the way, it was time for the exam! Now the word “exam” scared me a bit but I was relieved to see that it was nothing like a university essay, or even GCSEs come to think of it! I think Thomas must have seen the look on my face because he reminded me again, “It’s OK, ten year old kids do this!” I was relieved to see that it was another multiple choice/fill in the blanks page of about 40 questions this time and thankfully, yes I passed! I passed the first hurdle! We finished the day with a little bit of preparation for tomorrow. I finally got my hands on my diving equipment, which I shall henceforth no longer refer to as “the bits”, as I now know that I assembled my oxygen cylinder with the regulator first stage, linked up the low pressure inflator and threaded it through the buoyancy control device and tested the pressure with the submersible pressure gauge, followed by inflating the buoyancy control device and checking the primary regulator second stage and the alternate air source second stage. And if that all sounded like mumbo-jumbo to you, I’m pretty confident that after an enlightening and anything-but-boring day in the classroom it’ll suddenly make sense to you too! Tomorrow…I’m leaving the classroom behind me and will finally be getting into the water! I can’t wait. 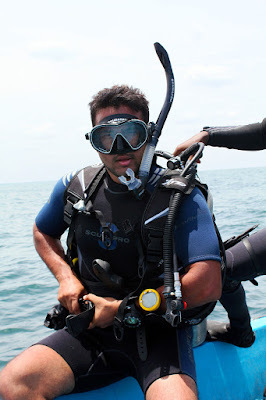 I hope you enjoyed reading this and that it gave you an insight into learning to dive. I’m of for a “sensible” early night, and will be posting an update on tomorrow’s adventures tomorrow! Click here for Part Two and here for Part Three. For more information on diving in the Maldives check out www.maafushidive.com.